If you're wondering about the piece above, it use to be a dilapidated fence in North Berkeley. “One man’s trash is another man’s treasure” could not ring more true for Berkeley-based sculptor and artist Lutz Hornischer, who fashions sustainable/reclaimed wood into modern and beautiful designs. Everything from beautiful wall art to free standing wood pieces, Lutz likes to reimagine the beauty of non-taken care of wood. Lutz started creating and building things as a child, but just like many other early artists he was told to first get a "real job". After receiving degrees in marketing and engineering, he worked for many years in entrepreneurial and product marketing roles for high-tech companies, the last seven years as a consultant and founder of Startup Ramp. He helped build companies, launch new products, and designed new customer experiences for websites. Throughout his high-tech career in the San Francisco Bay Area and Silicon Valley, he continued doing art such as sculpting, fresco painting, drawing, wood working, mosaic projects and design. Finally, when he started his journey through a midlife crisis, he did not buy a convertible or a gorgeous sports car, he actually sold his car, got an old Honda truck instead and started looking for wood for his new life purpose. "I enjoy the specific challenge of working with reclaimed wood," Lutz told us, "old wood has scratches, cracks, knots and other imperfections that are similar to real life. Every piece of wood is like a person, with its unique character, challenges and strengths. I yearn to give the wood a new life and I hope my redwood sculptures inspire people to find meaning, purpose and maybe to seek a new beginning in life." Lutz also explained to us the power of having handmade art in ones home or space, a truly zen type of feeling. 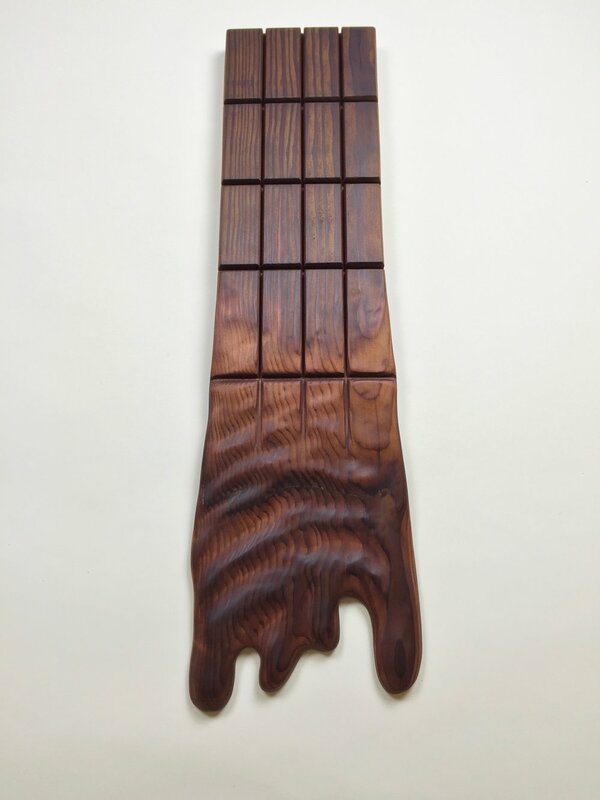 "During a recent art show, I talked to an interior designer about my wooden wall art and sculptures. She said that more and more people like to include natural materials such as wood into their home design projects," Lutz elaborated, "especially reclaimed and salvaged wood is becoming more attractive to people in the San Francisco Bay Area and Silicon Valley. Many of theses modern design projects are based on hard surfaces such as concrete, steel and glass, wooden wall art and sculptures can act as a complementary element—bringing in warmth, color and aliveness. Since I use linseed oil for my work instead of varnish, the colors and grain of the wood radiate in a dramatic way. In addition, the linseed oil surface gives the piece an almost sensual feel when touched and sculptures are meant to get touched to fully experience their beauty." But if you wanted to see the work up-close and in person, Lutz will be participating in a 16 artists exhibition with various other 3D artistry. Enjoy live music by Caleb Murray and the Blue Horizon, a smooth jazz quartet, and food from Troya, a local modern Turkish-Mediterranean eatery. Just in case if you wanted to add more art networking in your life. // 685 7th Street, SoMa, Thursday—November 2, 2017 from 6 p.m. to 8 p.m.
Get the newsletter everyone talks about.